A little girl who lost both her arms and legs to meningitis is jumping for joy – after being crowned a national trampolining champion. Brave Izzy Weall, 12, was rushed to hospital when she collapsed six years ago just hours after going to school as normal. Her parents, Oliver Weall and Catherine Lloyd, both 42, were warned she had just hours to live after she suffered a heart attack and multiple organ failure. She battled back but surgeons were forced to amputate both arms and legs after she was diagnosed with bacterial meningitis. When she recovered from surgery she spent more than two months in hospital and a further eight months in a wheelchair before being fitted with prosthetic limbs in 2011. 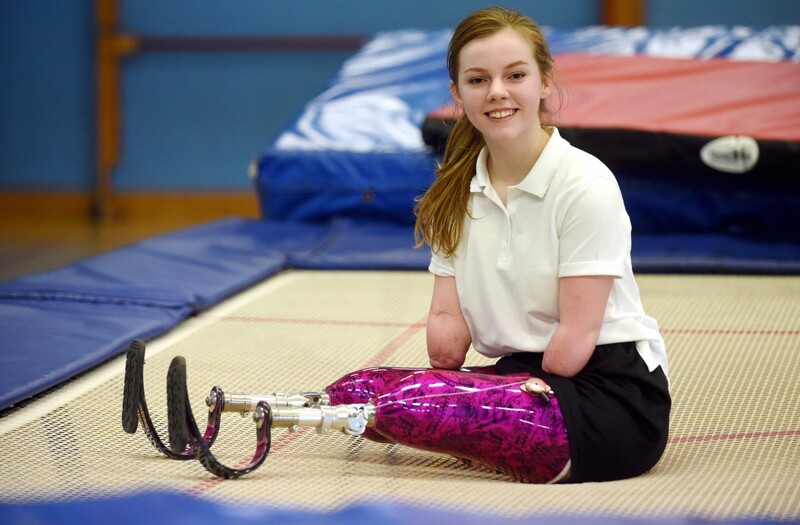 Five years after learning to walk again Izzy has stunned medics and her family by winning a national trampolining competition. 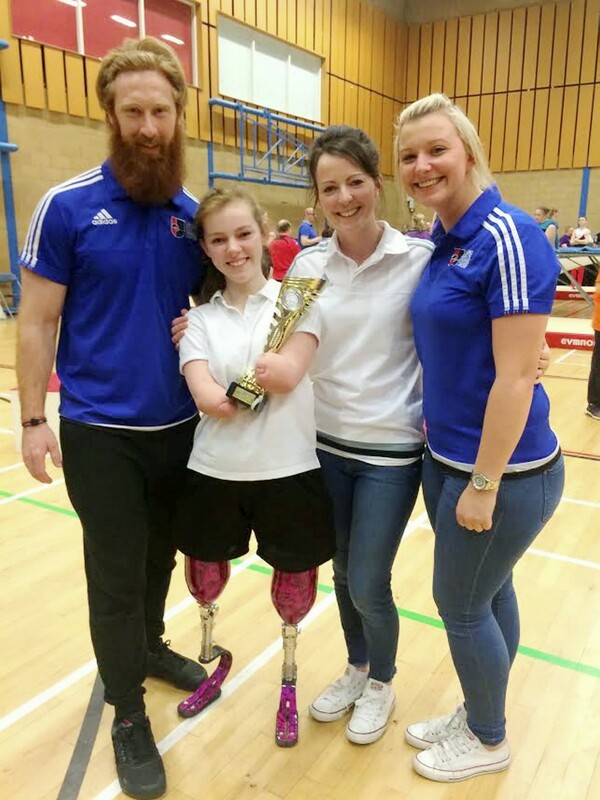 Inspiring footage shows Izzy performing a range of difficult jumps and twists which saw her crowned national trampoling disability champion last December. Izzy, of Oakwood, Derby, said: “It’s really exciting to have won and it took a while to sink in. “It was an amazing day. I had so much fun performing in front of everyone. “I’d always liked the idea of trampolining and my school had a club after school and my friends went I really enjoyed it so continued to go. I’ve been doing it just over a year. Izzy was given just hours to live when she was struck down with meningitis at school in September 2010. Mum Catherine Lloyd, 42, said: “It was so quick. She went to school that day and she got sent home ill at 11am. “We called an ambulance at 8.30pm and she was taken to Derby Hospital. “She was then transferred to Nottingham Hospital, and her heart actually stopped in the ambulance. She had total organ failure and we were told she would die. “But somehow she survived. She was in hospital for two months after that, and was in a wheelchair for eight months. “We were sure she would never walk, but she was so determined. When she was given her legs she got straight up and started walking right away. Izzy was wheelchair-bound for eight months after her amputations but managed to take her first steps on prosthetic limbs by August 2011. Incredible footage shows her performing a pike jump followed by a seat landing half twist and full twist at her school, Laundau Forte college in Derby, where she trains. 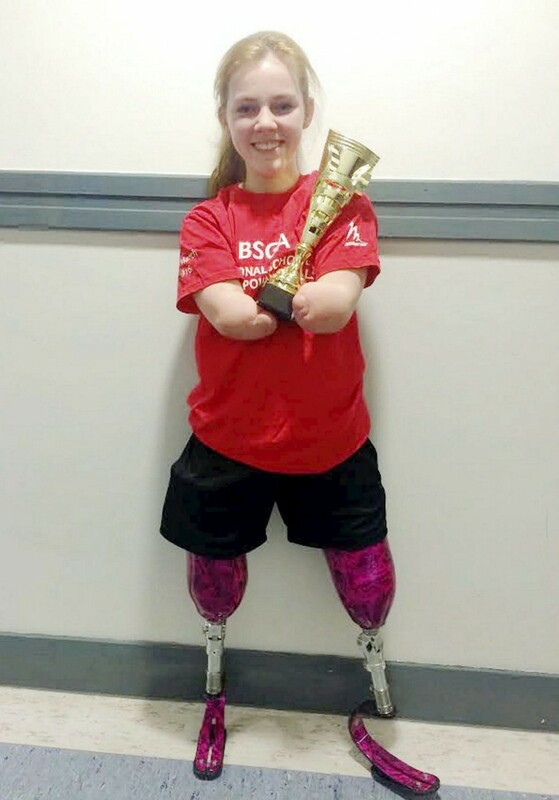 Izzy trains two hours a week at the school and hopes to compete in an international competition later this year. Full-time mum Catherine said: “I’m so pleased, I’m very proud of her. “Izzy has her trophies all lined up on the windowsill, I don’t know if she is trying to fill the whole thing, we’ll see. 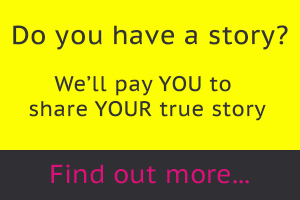 “She started trampolining just because her friends were doing it, and she wanted to go along. She doesn’t see herself as disabled and wants to do everything they do. “She wasn’t sure if she’d be able to do it, but luckily her teacher was amazing with her and got her doing routines. “Izzy goes after school once a week, then practices her moves in the garden on our trampoline. “Twists are really hard for her, and she can’t do any flips because the blades might chop her head off. Dad Oliver, a manager at Rolls-Royce, added: “It’s inspiring to see what Izzy has achieved. The couple have two other children, sons Alex, 11, and Josh, seven. PE teacher Nicole Haigh said: “This is an amazing success for Izzy who does trampolining every week at the college. “She was very nervous but managed to hold it together to do the two best routines I have ever seen her do. “Her compulsory routine was fantastic but her voluntary routine was just the very best. “She put a full twist on at the end which is extremely difficult for her but she managed to complete the full 360 degree turn. “We’re all incredibly proud of Izzy and I admit I cried when it was clear she had won. « Previous post Oh my Bard! This couple who met while rehearsing a Shakespeare play have now been cast to play Romeo and Juliet.